Japan's Emperor Akihito has expressed his intention to retire and relinquish his title in the next few years, the country's public television said Wednesday. 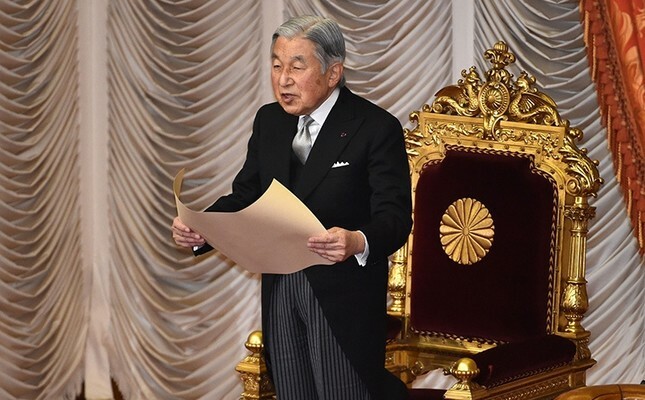 The 82-year-old Akihito in recent years has referred to his old age and admitted to making small mistakes at ceremonies, and the Imperial Household Agency has suggested reducing his duties, while giving more responsibility to Crown Prince Naruhito. The NHK report, citing unidentified agency sources, said Akihito did not wish to remain emperor if he had to reduce his official duties. He has told palace officials that he doesn't wish to cling to his title with drastically reduced responsibility or by arranging a substitute, the report said, adding that Akihito has been mulling the possibility over the past few years. Despite his age, the emperor has maintained a busy schedule and attended ceremonies, greeted foreign dignitaries and traveled to northern and southern Japan to comfort residents following deadly earthquakes. Akihito has also attempted to soothe some of the wounds from World War II, traveling to China early in his reign and visiting major battlefields. He visited the western Pacific nation of Palau last year, and the Philippines, one of Asian victims of Japan's wartime aggression, earlier this year. It was not known if he had a timeline to relinquish his title to Naruhito, 56, the elder of his two sons and first in line of succession. Naruhito's wife, Crown Princess Masako, a former diplomat, is still recovering from a stress-induced mental condition. Kyodo News agency carried a report similar to NHK's that quoted government officials. The Imperial Household Agency declined to comment, and denied any speculation about Akihito's health. The Imperial law does not specify rules about a living succession, including what happens to his post-retirement status. Kyodo quoted unidentified government sources that a succession while he is alive requires a revision to the law. According to the traditional count, Akihito is 125th in a line of emperors that began with Jimmu in 660 B.C. Historical records suggest the throne dates to at least the fifth century, making it the oldest surviving hereditary monarchy.